Let’s tackle the final two months of 2011 together and publish just one regret post instead of the usual two. I don’t have any good explanation why I’m doing this other than I simply forgot about the series. In essence, the blogging world or the online business world is mostly focused around WordPress and its various applications. However, WordPress is not the only online platform to choose from. There are some alternatives, and I talked about some of them in one of my previous posts (Hate WordPress? Here are 13 Alternatives), but there’s at least one more possibility that deserves a separate coverage – Tumblr. 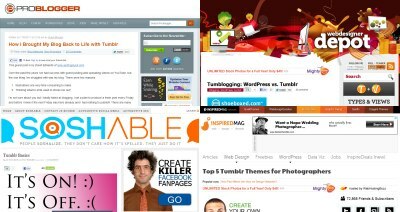 Tumblr is a blogging platform, just like WordPress, only nothing like it. Tumblr was originally designed to be a simpler environment than WordPress. The platform is a bit easier to use, but you don’t get as many features, so there are both good and bad sides to it. In essence, blogs hosted at Tumblr usually propose a more condensed experience with shorter and more entertaining posts. Is it a good alternative for you and your online business? I don’t know, so let’s find out. Here’s a set of 6 great blog posts from the past months (November and December 2011) which I regret I didn’t come up with myself. A little social proof for starters. If Alicia Keys thinks that Tumblr is just the right choice for her then maybe you should take it into account too. Find out what Alicia had to say about Tumblr. Apparently Tumblr has a lot of tricks up its sleeve. One of them – as described by David – is that it’s a great tool for bringing a blog back to life if you are lazy. Tune in to get David’s story. This is a short post by Simon where he describes some advantages and disadvantages of both platforms by using some easy to read bullet points. In the end, deciding whether you want to give Tumblr a try or not is up to you, but it’s always good to get other people’s point of view. This is an explanation of some of Tumblr’s characteristics (like being down most of the time – a big downside to Tumblr) and a quick video tutorial explaining the basics of Tumblr’s interface. Worth to have a look at if you’ve never been to Tumblr. So you like Tumblr, but you’re not convinced to the platform itself? No problem, you can still use WordPress, and set it up in a way so it looks just like Tumblr, and operates in a very similar way too. Find out how to do that. I know that it sounds like a niche, but hear me out. Themes for photographers are usually slick and highly focused around presenting short posts properly (often containing just a single picture). This is what Tumblr is essentially about, so the gallery is a good example of Tumblr’s overall feel.